So this week concludes week 17 in playing fantasy sports. Can you believe how fast the year is going by? It seems like yesterday I was celebrating New Years Day and now 17 weeks have come and gone in 2017. Let's take a look at how I did this week in fantasy sports. Tuesday started off with a small loss. Wednesday was a bigger loss. Thursday, I had a win and made up some ground. Friday I broke even. I took Saturday and Sunday off. Monday I got a small win. Overall, the week ended up being a losing week for me. I finished the week with a -1.35% ROI loss. Today I want to talk about the concept of luck vs variance. It's a concept that not a lot of people understand in the fantasy sports space. However, it is a very important concept to understand. 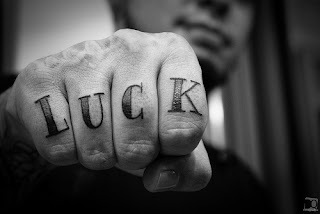 According to Google definitions, luck is success or failure brought about by chance rather than through one's actions. Variance is a statistical term that measures how far a data set is spread out. The game of fantasy sports involves both luck and variance. To be successful at it, it helps to know what the difference is between luck and variance. For example, when I won my first guaranteed prize pool tournament taking first place in a NBA contest, I had several players in my lineup that were playing in the last game of the night. That game was a close game. However, based on the pace of that game, I was projected to finish no higher than 5th. However, the game ended up going into overtime and as a result, I was able to score extra points that I was not projected to score. Thus allowing me to win the tournament. The game going into overtime was luck. There was nothing that I could have done to control whether that game went into overtime or not. However, the individual fantasy points that the players on my team produced was variance. Every night, those players score a certain amount of fantasy points. On this particular night, they happened to score to the higher end of their normal range of points, thus allowing me to win the contest that night. So how does variance work in fantasy sports? As I mentioned above, variance measures how far a data set is spread out. So, over a 10 game period if a fantasy sports player scored 20 fantasy points exactly in every single game for 10 games, that player would have a variance of 0. If you drafted that player, all things being equal, you would expect that player to score 20 fantasy points. However, no fantasy player has a 0 variance. Some players have a higher variance than others. Russell Westbrook has a mean score of 61.84 and a variance of 200.496. Stephen Curry of the Golden State Warriors, if you take his last 10 games in the month of March, he has a different mean score and a different variance. Stephen Curry has a mean score of 49.5 and a variance of 78.18. This means that Stephen Curry is more likely to produce a fantasy score closer to his mean score of 49.5 than Russell Westbrook is to his mean score of 61.84. All things being equal, if you are looking for the safer play, Curry would be the safer play. If you are looking for the play with more upside, Russell Westbrook would be the play with more upside. Variance is also important because the variance of players is going to be different based on what sport you are playing. I just provided examples of variance for basketball players. Let's take a look at baseball. In this case, again all things being equal, Mike Trout would be the safer play and Carlos Gomez would be the play with the higher upside. So how does this relate to luck? When Mike Trout scores 35 fantasy points that's not good luck. That's variance. The same is true when he scores 5 fantasy points. That is an example of variance. By understanding the difference between luck vs variance you will be able to make better decisions when creating your fantasy sports lineups.